Hebrews 3:14 “We have come to share in Christ if we hold firmly till the end the confidence we had at first. There are times in life when you will feel exhausted and overcome with your circumstances. God beckons us to come to Him for strength during these times. One thing that has been a great blessing to me and has helped me to hold firmly to my confidence in God’s provision has been daily devotional guides. I have lots of them and keep them strategically placed all over the house. I don’t read every one every day, but when I feel like I need a pick-me-up, I can grab the nearest one. It is amazing how God always seems to place in my hands and heart the exact words I need to keep me going. Today I am going to share one I read recently. 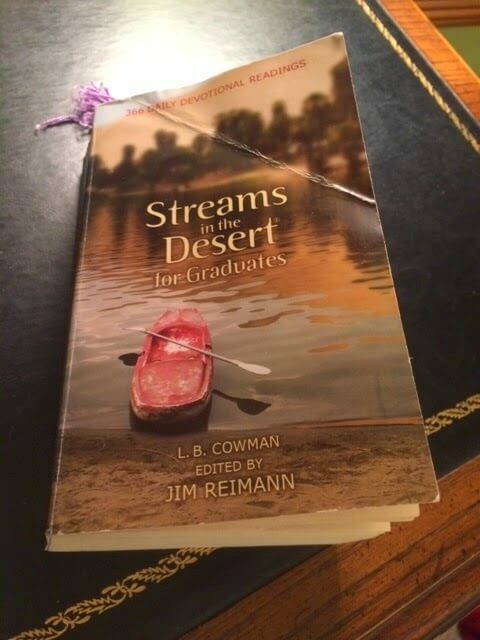 It is taken from Streams in the Desert by L.B. Cowman. I hope that it will be an encouragement in a day when you feel overwhelmed with your circumstances. Keep holding firmly to your confidence in Christ. He will never fail!